Tesoro Trench 19 was excavated in 1972 by Anne Booth ( see AB I ) and Jenifer Neils. This area lies to the north of the north wall of the Upper Building and is a continuation to the east of T-18, the area excavated by Eva Rystedt in 1971. The area excavated comprises approximately Grids D-I/31-53 and J-51-54 ( see plan, p. 184 ). Excavation was concentrated in the area of the heavy tile fall - grids G-I/31-47. This area showed little strata variation: humus (topsoil); brownish soil mixed with small chipped rocks and small terracotta fragments; and the heavy tile fall layer. slope downward (cir. 75 cm below topsoil) and move to the north. In grids G-I/45-46, a second layer of smaller tiles, possibly a continuation of the first, was excavated. However, in the rest of the trench, digging stopped below the upper tile fall. At the 47th meter where the tile fall stopped, a possible stone foundation running N-S was uncovered ( see photos on p. 62 ). Another line of stones, prallel to the first and approx. 2 meters to the east, appeared in grids H-I/49. The southern portion of this possible foundation remains covered by a stone heap, so it is not possible to determine its extent. The stone pile which covered the foundations in grids G-I/53 was removed; this wall extends to the W wall. 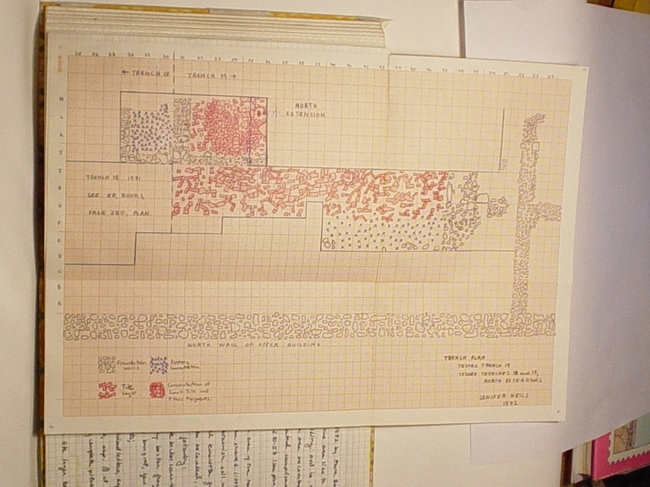 reddish-orange fine-grained ware was excavated in grids G-J/50-54. Note: This pottery summary does not include the area excavated by Anne Booth. See AB I, p. 83-86 and p. 171-177 for her summaries. The north extension of Trench 18 comprises grids J-M/28-30, and the north extension of Trench 19 comprises grids J-M/31-36. The northernmost part of these trenches was not excavated due to rocks at the surface (M/28-36). The strata in T-19 include: humus (topsoil); a dark brown soil layer with small chipped stones; a yellowish tan soil layer; and a reddish brown tile layer. At the level of the reddish brown stratum, part of a N-S wall foundation of heavy stones and a few tile fragments was uncovered in the 31st meter. A possible cross wall running E-W, consisting of small stones and many tile fragmnets, was left at the south end of this trench: its full width remains unexcavated. The tile layer (heavy concentration of small, tightly-packed terracotta fragments and carbon) and the large sections of pithoi directly above were lifted. The trench was left at the level of a hard, yellow pavement (?) - very uneven. The strata in T-18 include: humus (topsoil); a brown soil stratum; yellow soil stratum; and a red stratum with heavy carbon. At the level of the red stratum, a N-S wall foundation of heavy stones was found in the 28th meter. The possible wal lfoundation running E-W, found at the south end of T-19, extends across the south end of T-18, J/28-30. Scattered tile fragments were found in the yellow and red strata. T-19 did not produce a great quantity of pottery - mostly coarseware from the brown and yellow strata. Finer sherds came from the tile layer, and directly above. A few nearly complete vases were uncovered in L/35. A heavy concentration of pithos fragments was found directly above the tile layer. T-18 had very heavy concentrations of fine bucchero in the yellow ( JN III, p. 175 ) and red strata ( JN II ). Coarser ware predominated in the upper strata. The yellow soil layer produced a large quantity of black bucchero sherds - about 7 nearly complete stemmed, handleless cups (to be restored in 1973). The reddish soil layer also produced large quantities of sherds - predominantly burned red. This pottery is to be cleaned and restored in 1973. For finds see JN II. Note: Under this reddish soil layer is a heavy carbon layer and possibly a wooden beam in J-L/30 which has been left covered until 1973. Summary: Bucchero "compotes," T-18 North Extension, Yellow stratum. See JN III, p. 171-173.